Jackie Wiggins, who still lives in the North Philadelphia house where she was born, helped organize the protest that shut down Temple University’s March 6 town hall to discuss its proposed football stadium. Ever since Temple University first floated the idea of building a football stadium at Broad and Norris in early 2015, the project's supporters have asserted that the damage to the adjacent North Philadelphia neighborhood would be slight. Embedded in this claim is the assumption that there is hardly any neighborhood left to damage. Temple has compounded this misconception during the last three years by failing to convene a single community meeting to explain the project — that is, up until this week's debacle of a town hall. Temple treats its proposed closure of a two-block stretch of 15th Street, a vital piece of the city grid, as a minor inconvenience to residents, even though it has yet to release a long-promised traffic study. On social media, some stadium proponents seek to diminish the neighborhood's relevance by putting the words community members in quote marks. It's as though North Philadelphia, once the epicenter of the city's black civil rights movement, were already history. Tell that to Ruth Birchett and Jackie Wiggins, the two grandmotherly residents who are the proud ringleaders of Tuesday night's protests. Born and raised in North Philadelphia three blocks from the stadium site, they have spent the better part of seven decades there. They sent their children to North Philadelphia schools, volunteered as block captains, and checked in on elderly neighbors, even as redlining, riots, the crack epidemic, and the influx of student housing chipped away at their world. Birchett never even left the neighborhood for college, choosing to attend Temple. She still has the same phone number her family used when she was born in 1951. Two lifelong North Philadelphia residents in their 60s, Ruth Birchett (second from left) and Jackie Wiggins (second from right) are leading the fight against the proposed Temple University football stadium. They signed up their neighbor Denita Woodson (left) to run for Democratic committee in the 32nd Ward. With them was Carolyn Johnson. On the morning of Temple's town hall, I found Birchett and Wiggins on Norris Street, dressed for battle in sensible puffer coats, sneakers, and wooly granny hats. Wiggins' shiny red Toyota, nicknamed "The Scooter," was parked nearby, ready to be outfitted with bullhorns for the protest. As part of the stadium fight, Birchett and Wiggins have been signing up people to run for their ward's Democratic committee. At one point during our conversation, the two women buttonholed a Norris Street resident, Denita Woodson, to pitch her on the job. "You're young. You have a family. You need to do it," Wiggins told her. Before Woodson could open her mouth to object, Wiggins handed her a clipboard, signature list, and a fat stack of "We shall not be moved" posters. "You have to get the list notarized," Wiggins cheerily reminded her. "This afternoon." Both veteran community organizers, Birchett and Wiggins leaped into the stadium fight in 2015 and have been holding regular meetings ever since. Working with the Rev. William B. Moore, pastor of Tenth Memorial Baptist Church, at 19th and Master, they called their group the "Stadium Stompers" and formed alliances with sympathetic Temple students and faculty. Ronald Amour, 73, speaks against the proposed Temple University football stadium at the March 1 Stadium Stompers meeting attended by more than 200 people. Their efforts paid off when more than 200 people showed up at a March 1 meeting at G.W. Carver Engineering and Science High School on 16th Street, whose front door would face the back of the proposed stadium. Part pep rally, part gripe session, the meeting became an occasion for neighborhood residents to show their strength and vent about a host of neglected issues, from noisy student parties to gentrification. 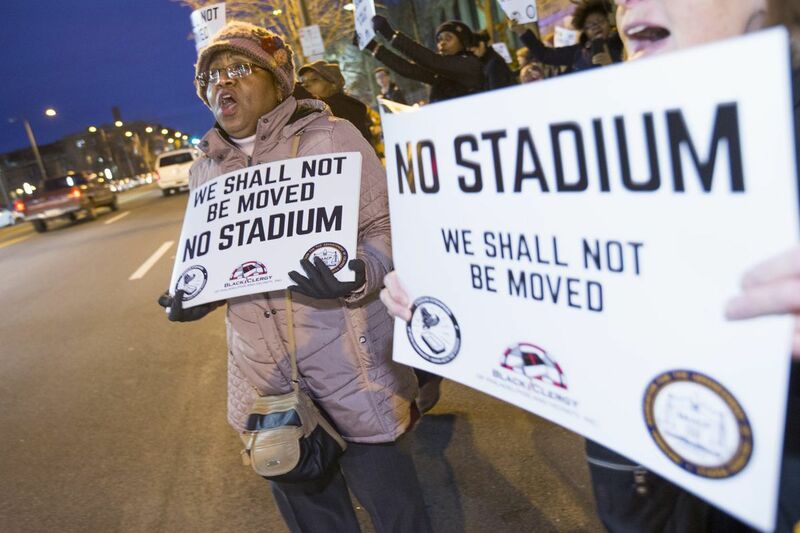 Aside from the loss of 15th Street, residents fear the scale of the 35,000-seat stadium would overwhelm their rowhouse neighborhood and attract drunken tailgaters. "People look at our neighborhood and blame us for its condition. It's not our fault," Birchett told me Tuesday as we stood in front her childhood home on the 1900 block of Norris, across from two immense vacant lots. When she was growing up, that stretch was lined with houses and small businesses, including a linen shop where Birchett bought hair ribbons. The lots are owned by the city and have been untouched since the last house was pulled down during Mayor John F. Street's administration in the early 2000s. Temple University’s latest stadium design includes classrooms along Broad Street. The bowl was sunk slightly below grade in an attempt to keep the building from overwhelming the rowhouse neighborhood. Part of what drives the opposition to the stadium, Birchett said, is the feeling that their North Philadelphia neighborhood is being ignored, not just by Temple, but by their elected officials. Little has been done to stem the tsunami of poorly built student housing. Darrell Clarke, the powerful Council president, who represents North Philadelphia, did not attend either the March 1 rally or Tuesday's town hall, claiming scheduling conflicts, although he has said he would respect the community wishes on the stadium. Their state senator, Sharif Street (son of the former mayor), has been similarly aloof,. He did send a representative to the March 1 meeting, however. To a neighborhood that still fondly recalls civil rights leader Cecil B. Moore, who held the Fifth District Council seat until his death in 1979, the elected officials' inaccessibility has been grating. Many opponents fear a sellout. The neighborhood's frustration rose to the surface at the March 1 meeting, when the room broke into chants of "Throw them out. Throw them out." Several months ago, Birchett and Wiggins gathered a group of Stadium Stompers and showed up uninvited at Clarke's office, demanding a meeting. Last week, the women traveled to Harrisburg to voice their opposition to using state money to fund the $130 million stadium. They visited several members of Philadelphia's legislative delegation, including Street and Sen. Vincent Hughes, who both serve on the Appropriations Committee. During a March 1 meeting organized by the Stadium Stompers and Black Clergy of Philadelphia, three chairs on the stage highlighted the absence of Temple president Richard Englert, City Council President Darrell Clarke, and Temple board chairman Patrick O’Connor. The lack of leadership on the stadium issue has been striking. Elected officials in Philadelphia routinely show up at community meetings, even for the most piddling construction projects. Yet only State Rep. W. Curtis Thomas, who is retiring this year, attended the Stadium Stompers meeting. After the town hall broke up Tuesday, I ran into Karen Warrington, who grew up in the neighborhood and who now serves as communications director for U.S. Rep. Bob Brady (D., Phila.). When I asked her about the absence of elected officials, she replied without hesitation that "Darrell and Sharif really need to have a voice in this." The community's anger came to a boil at Temple's town hall on Tuesday. Birchett and Wiggins egged on the crowd with chants. But Temple president Richard Englert seemed oblivious to the pain and history that drove the opposition. Reading in a near-monotone, he listed all the wonderful things Temple planned to do to improve the neighborhood, without fully acknowledging that the neighborhood had never actually been consulted about any of the proposals. Warrington wasn't surprised when the meeting dissolved into chaos: "If you say you want a dialogue, you can't talk at people." Former City Councilman Frank DiCicco stands next to Temple University president Richard Englert after hecklers prompted the school to cancel a presentation on its proposed stadium. When Temple announced that it was canceling the presentation just 10 minutes into the proceedings, Englert looked relieved as he slumped into a chair. Next to him stood former Councilman Frank DiCiccio, now a lobbyist and adviser to Temple. DiCicco is also head of the Zoning Board, which will almost certainly have to weigh in on the details of a stadium design. For Birchett and Wiggins, it was another reminder that their struggling North Philadelphia is on its own in this fight.